Home Politics DID YOU KNOW THAT KOGI STATE GOVERNOR, Yahaya Bello Has Made Some Great Achievements In Rice Farming In The State? DID YOU KNOW THAT KOGI STATE GOVERNOR, Yahaya Bello Has Made Some Great Achievements In Rice Farming In The State? Before now, I had been one of those who saw everything bad in the Governor of Kogi State, Yahaya Bello, without giving him some benefits, simply because I had expected more and still do, as a young person, who should be more proactive than he is, but going about this ONE-SIDED, wasn’t gonna help me or anyone for that matter. My hatred for him climaxed with the attempted RECALL of Senator Dino Melaye, a Senator with whose corporation I felt should have been more cordial to move Kogi State forward, but nothing is cast in stone in politics, anything can happen and they two will come back again, so, I pulled out for them in that regard. But, we must, even in our collective condemnation of bad governance, which is what I do a few times, highlight some of the few achievements, no matter how minute, his little achievements in Agriculture with the Kogi State Rice Farms and Factory at Omi, Yagba West Local government area of Kogi state ( Kogi west senatorial district) which has been successfully completed, set for commissioning and mass commercial production of rice in the state. Before the advent of Yahaya Bello’s administration I am told, Omi Dam was a ghost town, but today, aside from the rice meal, the state has massive agricultural activities including fish farming that has the capacity to employ over 2000 citizens to manage the farm. Yes, I will continue to ask for the Governor of Kogi State, Yahaya Bello to pay salaries of workers and pensioners, but must not fail to talk about the few things he is doing well, which includes this project. I don’t know the capacity of this rice factory, but it will provide a lot of jobs for the teaming Kogi youths in the state, which is why I will continue to clamour for the offsetting Of Salaries, so the citizens of the state would be financially empowered enough to buy the rice from the state. Out of curiosity the other day too, I made serious enquiries about this issue of Salary in the state and a state official was truthful enough to give a view details which alluded to the fact that Yahaya Bello is owing, but with a promise that soon, the salary issue in the state will be history and I believed him completely. So, let’s congratulate Yahaya Bello, even as we ask him to do more, because, the expectations are high on him, especially in the area of payment of worker’s salaries. -The rice milling plant is a 50 ton per day capacity with a 80 tons parboiling capacity. However the 50 ton process can be completed in 8 hours, which means when put to maximum capacity the plant can easily run over 3000 tons per month and over 36,000 tons per year. This is equivalent to the production of over 720,00 50kg rice bags per year. -The Kogi rice milling process will not only produce finished international standard quality rice but also the following by-products. The rice bran is part of the products used in making fish feed. The Kogi Rice Milling Industry will set up a mini fish feed processing plant for community empowerment, which will generate up to over 200 direct and indirect jobs. In most countries the brown rice is used for making local beer, depending on the quantity the Kogi Rice Milling Industry can get per ton, the industry can either sell to the open market or create a local beer factory to create empowerment and more business around the area. The rice husk will be used as the industry’s 100% fuel to power the 500 kWh biomass generation plant which runs the industry. This will drastically reduce operation cost as the industry will not be buying fuel to power the plant. The broken rice can be used to make rice flour, depending on the quantity, the industry is set to also produce Confluence Rice Flour which will soon be in the market. The plant has its own independent power generation plant which is powered through biomass gasification technology. The capacity of the plant is 500 kWh and the rice milling plant capacity at every processing line (shift) is 200kwh which means the industry generate more power that it needs. With this development, the Kogi Rice Milling Industry will have an excess power of 300kwh which will be used to power strategic locations in the community. Currently, the Industry has 800 hectares nucleus rice farm that feeds the processing plant, the 800 hectares produces around 3200 tons of paddy yearly, the processing plant will consume the 3,200 tons in just a month meaning, expanded rice cultivation is encouraged to meet the feedstock. The industry will purchase paddy from local farmers across the state and also increase the capacity of its nucleus farm to meet up with the rice milling plant production capacity per year. As today, the farm is currently generating 300 direct jobs, which comprises of farm staffs, hunters and equipment operators. The industry can also generate over 5000 indirect jobs through its Out-Growers empowerment program, last year it empowered 150 local farmers through the office of Her Excellency the Wife of the Executive Governor of Kogi State. Once the rice mill commences operation this February, the industry will be employing another hundreds of staff, as it plan to run the plant at the maximum capacity on two session day and night shift per day. Each shift will produce over 50 tons of finished Confluence rice. The Kogi Rice Milling industry, through its processing operation gives more nutritive food and conserves rice by way of recoveries. It also increases the shelf life of rice. 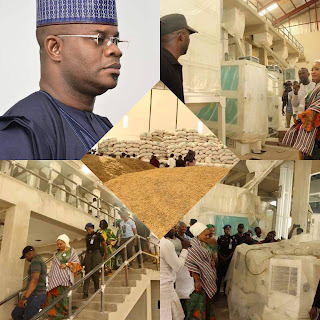 By establishing the Rice Milling Industry; His Excellency Alhaji Yahaya Bello is Using one stone to kill two birds; while fighting food insecurity by increasing food production, he is also fighting the scourge of unemployment by creating direct and indirect jobs. This is what the NEW DIRECTION I am told stands for and Gov. Yahaya Bello is steering the ship to the next level of development in the state.